We take over the British Museum with a rebel Sunken Cities ceremony – BP or not BP? Posted on November 28, 2016 December 7, 2016 by BP or not BP? On Saturday, over 40 campaigners from 8 different countries including the US, Argentina and India held a four-hour-long performance-protest inside the British Museum, calling for its sponsorship deal with oil giant BP to be dropped. They argue that climate-denier Donald Trump’s election as US President makes it even more urgent that cultural organisations stop promoting fossil fuel companies. Performers process through the museum. Photo by Kristian Buus. The performance, led by theatrical protest group BP or not BP?, began at 2pm in the museum’s Great Court, where a “flood” of black and blue material spread out from a giant BP logo to symbolically threaten seven cities at risk from rising seas in the coming decades. The performance then moved throughout the museum’s iconic galleries, weaving together original poetry sent from Lagos, Nigeria, a short film contributed by residents of Shenzhen, China, and other texts from cities at risk, including Alexandria, New York and London. It marks the final weekend of the BP-sponsored ‘Sunken Cities’ exhibition and this will be the ninth protest that has taken place during its 6 month run. The action was highlighted by an in-depth feature in the Financial Times on Saturday morning, including interviews with some of the performers and hints about the performance itself. As part of the performance, a vigil was held for political prisoners in Egypt, where BP continues to support the brutal military regime. Photo by Kristian Buus. 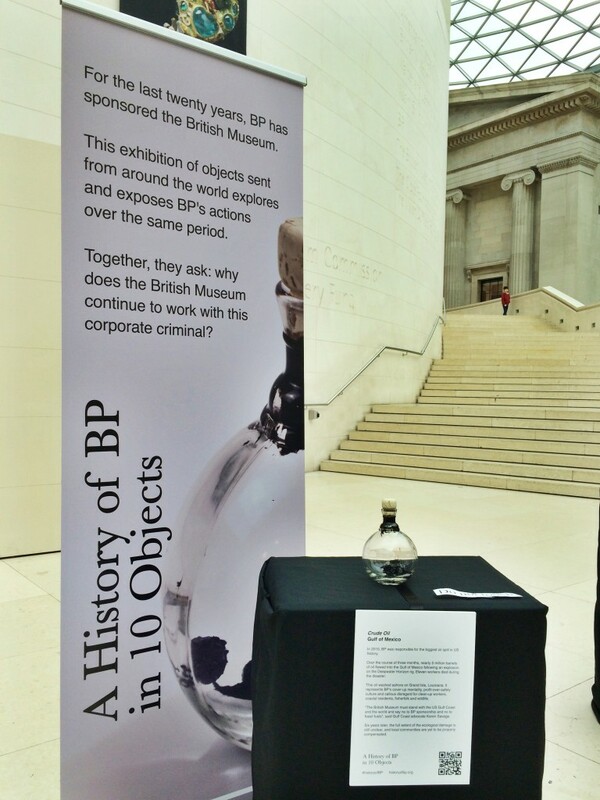 A poll earlier this year found that more Londoners wanted the British Museum to end BP sponsorship rather than keep it, by a significant margin and a March 2016 survey of staff at the British Museum by the PCS Union found that two-thirds of staff believed the museum should drop BP as a sponsor. For details of the survey of Londoners and British Museum staff, click here. Each city was represented by a glass bottle containing water. Photo by Kristian Buus. Performers from The Living Theatre in New York create a powerful spoken word performance about their hometown. Photo by Kristian Buus. This is the third creative protest against BP sponsorship in 48 hours. Last night, BP or not BP Scotland gatecrashed the opening of the ‘BP Portrait Award’ in Edinburgh. Activists dotted around the gallery launched into an unsanctioned “toast” calling for BP to be dropped, while protesters dressed as oil workers greeted guests outside with flyers. On Thursday, a group of activists from Platform, another member of the Art Not Oil coalition, held an unsanctioned silent vigil in the British Museum’s ‘BP Lecture Theatre’ just moments before a Curator’s Introduction to the ‘Sunken Cities’ exhibition was due to begin. The group held larger than life images of political prisoners in Egypt, where BP is the biggest foreign investor. Their intervention was met with applause from the 200-strong audience. The British Museum’s recent decision to renew its controversial sponsorship deal has already come under fire from many quarters. Last month, BP or not BP? led over 200 people in an underwater themed flashmob – or ‘splashmob’ – inside the museum’s Great Court, featuring singing mermaids, BP pirates and a 40-foot sea monster puppet, which had been smuggled past the museum’s security guards. Campaigners called the new sponsorship deal ‘illegitimate’ after they exposed how the museum’s trustees had not been consulted about renewing the highly controversial deal. Following the announcement in July that BP had signed a new 5-year sponsorship deal with the British Museum, National Portrait Gallery, Royal Opera House and Royal Shakespeare Company, over 200 cultural figures and campaigners signed a letter published in the Times calling for the deal to be dropped, with Oscar-winning actor Mark Rylance among the signatories. “Another world is not only possible, she’s on her way”. Performers sing the words of Arundhati Roy as they reverse BP’s climate change, pushing the oil and floodwaters back over teh giant logo. Photo by BP or not BP? BP or not BP? is an actor-vist theatre group which campaigns against oil sponsorship of arts and cultural institutions, and is part of the Art Not Oil coalition. The group has performed inside the British Museum without permission 23 times since 2012. Photo by BP or not BP?